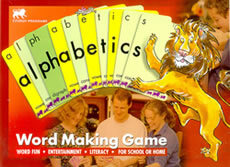 Provides 50 worksheets for sounding and writing the alphabet. Includes alphabetical order and two-letter words. Leads directly into the Readers and the Word Skills. This book has 50 x A4 pages designed for absolute beginners. The first 5 pages help with the forming of lines and circles. Then there is a page for each letter - help with writing, sounding and recognising. There are many activity pages helping with discrimination, alphabetical order, and forming two-letter words. The activities in this Alphabet Book are designed for absolute beginners, including pre-writing and letter formation. They are complete preparation for Fitzroy Readers 1 to 10 and for the Fitzroy Word Skills Activity Book 1. This is a word-making game using English letters and digraphs. There are two types of activities, one for beginners, and the other for older children and adults (50 possible levels). The package contains graded word lists, clear instructions for the teaching activities and rules for the higher table games. Now with a SHORT RULES sheet for those who want to get straight into the game. It is ideal for helping slow beginners. Also includes enjoyable after-dinner game for literate adults. The Fitzroy Program of Readers and Word Skills is not an ordinary set of story books and written activities with some phonics hints thrown in. It is systematic phonics. You teach letters of the alphabet and the sounds they represent. You explain that a written word is a string of letters showing sounds from the left to right. You teach children the skill of decoding English as they encounter it outside the classroom. There are hundreds of thousands of English words. You cannot hope to teach them all! That's why the Fitzroy Method teaches students how to approach new words, by understanding sounds and digraphs. The Fitzroy Method: How is it done? Begin by talking about sounds, then joining of sounds, thus making words. Our alphabet represents sounds, both by single letters (a, b, c....) and by digraphs (ch, ew, tion...). From sounds such as a, h and t we make words such as hat. Children like rules. They retain far more if taught rules and exceptions rather than item-by-item. Systematic phonics rewards children with regular victories. It is fun to know how to decipher a whole new family of words at a time - rather than having to endure a slow process of rote accumulation. In Australia, more than 3500 schools have bought the Fitzroy Readers. In Singapore, it has grant its footing that apart from Schools, parents are using them! We recommend them to you. Suitable for beginners who have learned most of the sounds of the alphabet. Readers 1-10 use only basic sounds, except for Story 9, which introduces the diagraph oo as in roof. Readers 11-60 features a basic English sound (eg. oy), a few sight words (eg.said), a revision word list and an extension word list. Workbooks to use alongside the Readers. Book 1 to 5 support a set of 10 readers, devoting 7 pages of activities to each story. 5. to enjoy the workings of English, to expand vocabulary and to write more artfully. Workbooks to use alongside the Readers. Books 6A supports stories 51-55 with 14 pages for each story. These Word Skills advance the student further in spelling, punctuation and basic grammar. 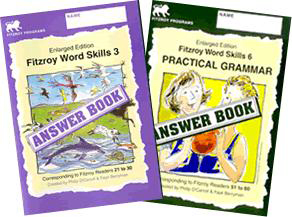 (They also include more advanced activities for the students who progress faster,) Fitzroy Word Skills Number 6A has the essentials of grammar for busy modern students. These can be used by students working on stories 51-55. Word Skills 6A is designed in A4 size page modules, making each topic a digestible activity for one session. Written in a large, generous, easy format, and presented in small logical steps, this work book provided a friendly approach for anyone trying to master English grammar. Workbooks to use alongside the Readers. Books 6B supports stories 56-60 with 14 pages for each story. Fitzroy Word Skills Number 6B has the essentials of grammar for busy modern students. These can be used by students working on stories 56-60. Word Skills 6B is designed in A4 size page modules, making each topic a digestible activity for one session. Written in a large, generous, easy format, and presented in small logical steps, this work book provided a friendly approach for anyone trying to master English grammar. Answers provided for Word Skills 1 to 6. Each answer page shows the full question page with the answers marked in. The level of English in each worksheet of the Word Skills is taken from the corresponding Fitzroy Reader. Containing ten of the Reader stories in each CD. These are careful pronunciations to cater for ESL students, for slow students and for story telling. The phonetic disk provides the phonetically correct sound for each letter. For example, the 'f' sound is voiceless and continuous as it sounds at the end of 'cliff'. This one is specially recommended for ESL students. The traditional disk provides an alternative way of sounding 13 of the letters. This is to accommodate teachers who use the traditional soundings such as 'fhhh!' (voiced ploseive), as in 'fish' without the 'sh'. This book fills a gap for many teachers who have not yet learned how to exploit the phonic features of English. Phonic methods are the secret to early literacy, as has been borne out by the phenomenal success of our materials in saving the literacy of many children across the country. Include sample lesson plans, spelling list and assessment tools for each level. This book is especially suitable for the Singapore market as some ideas are supplied with the help of the Singapore exclusive distributor, September 21 Enterprise Pte Ltd. The name of our town, Fitzroy, is known to thousands of children - mostly in schools across Australia, but also in New Zealand, Taiwan, Singapore and many other countries. This is because the title Fitzroy Readers is printed across the top of every copy of seventy children's story books created here in Fitzroy and published as a series for learning to read. Over this decade, a million story booklets have been printed. Back in the early seventies, we, Faye Berryman and Philip O'Carroll, met and started up Fitzroy Community School in North Fitzroy, an inner suburb of Melbourne. Many of the houses here are over a century old, built in the old English style. The school faces a leafy park, known as the Edinburgh Gardens. Faye had been a secondary teacher who had seen the sad outcomes for children who emerged from primary schooling with poor literacy. Philip had been a philosophy lecturer specialising in logic and linguistics. Between the two of us, we were determined to come up with a method of teaching that would ensure that every child could read well. 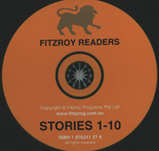 The Fitzroy Readers have helped children in over 3000 schools in Australia, and many children in other countries. Furthermore, since we published these, school systems across Australia have gradually re-adopted a phonic element into their reading programmes. And we sometimes wonder who is reading our stories. And we wonder how the teachers, children and parents who use the Fitzroy Readers in so many places far and wide, imagine Fitzroy, the source of their seventy stories. Giving children books and encouraging parents to read to their children is a lovely thing. However, as government policy, to be implemented as the weapon against Australia's poor literacy standards, it can only fail. Not only this, but such a government initiative will lull the general public into the false security that something practical is being done to remedy the problem. It is a big red herring. The real issue confronting us is the flawed literacy method used in most of our schools and taught to trainee teachers in our universities - namely the whole language approach. This approach, which was taken up by academics and schools over thirty years ago, may have been well intentioned, but it was/is not well founded. The whole language approach is based on the false premise that since children naturally acquire speech by exposure to the spoken language of the group they are born into, that the same will hold true for reading and writing. The theory goes: immerse the children in stories read aloud and they will naturally come to read and write. The Australian education industry (including our universities) has failed to acknowledge research findings - both local and international, and available over the past thirty years - that the whole language approach would fail many children, and that a systematic phonic approach to teaching literacy, should be employed. Humans are genetically endowed with the ability to acquire speech. But reading and writing are learned skills - as human history has consistently shown us. The first thing that a teacher of English to beginners must do is see how spoken English is transformed into its written form. English is an alphabetic language. We use the letters of the alphabet to represent our speech sounds. Teaching someone to read and write means explaining how the alphabetic code of English works. This is not done in most of our schools. Faye Berryman, English Co-ordinator, Fitzroy Community School. "The Phonic Approach" is one of the established methods of teaching children to read and write English. Its main rival is "The Whole Language" approach. The Whole Language approach presents children with words without exploring the sounds of the component letters. The child is expected to become familiar with the look of the word and remember the spoken word to which it corresponds. The Phonic Approach, by contrast, introduces children firstly to the letters of the alphabet and their basic sounds. Beginning with simple words, children learn how words are formed from these component letters. English uses combinations of letters (eg: sh, th, etc.) to make particular sounds. And there are of course some English words whose spelling does not conform to any phonic principles. These words must still be learned as "whole words". Objections to the whole word approach include the fact that children cannot decipher words they have never seen and are therefore at the mercy of their schooling for their vocabulary. With the phonic approach children can learn whole families of words at once - for example the ay words. Having learned the sound of ay the student can then read: bay, day, gay, hay, lay, may, pay, ray, say, way, stay, play, pray, tray, sway, etc. 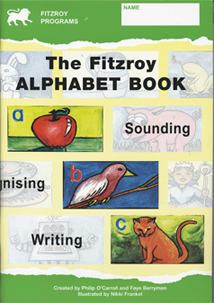 Before you start to read the Fitzroy Readers, you must learn the basic sound of each letter - A for APPLE, B for BOY, C for CAT etc. As well as basic sounds, there are extra sounds, represented by digraphs such as AY, ALL or EW. Words which are spelled according to the basic sounds of English and the extra sounds of English are sounding words. Basic sounds and extra sounds are phonic rules. Most English words are spelled according to phonic rules. Before you read each Fitzroy Reader, look on the back cover to see what new sound is being used. Also printed on the back cover of each Fitzroy Reader are the special words used in the new story. These are words which do not follow the phonic rules we have learned so far. Some words are special words because they do not follow any phonic rule, for example, EYE and THEIR. These are not sounding words, but must simply be learned by rote. There are some words in each story whose phonic rule has not been learned yet. For example, the word WITH in Story 7. The word WITH will be listed as a special word for story 7. This word will have to be learned before reading Story 7. Later, in Story 27, the phonic rule concerning TH will be learned, and WITH will no longer be a special word. The Fitzroy stories must be studied in numerical order, because later readers use the phonic rules of earlier readers. Welcome to the Fitzroy Readers. 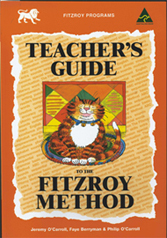 The Fitzroy Method is the most modern, most efficient and easiest way to learn to speak, read and write English. With the Fitzroy Method, we do not simply learn English words, one by one. We do something far more efficient. We learn to decode English words. We look at a word and we sound out the letters. Many English words lend themselves to this practice very readily, easy words like cat and dog. And there are many longer sounding words like picnic, fantastic, and expect. We provide stories for children to read. The first several stories are deliberately written with words which are easily decoded in this simple way. These early books establish the concept of reading by decoding. This also builds confidence and gets children reading English very quickly. 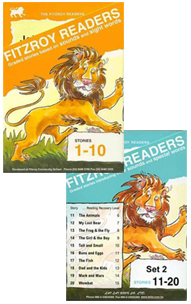 Each Fitzroy Reader (storybook) introduces a new code such as ·ee· and then presents a story for children emphasizing the ee sound. The story also uses all the words we have previously learned to read and spell. Thus we are reading steadily all the way through the curriculum. We do not have to wait until we have learned a great many words before we can read interesting stories. When we learn each new spelling code, we suddenly acquire not just one new word, but many new words all at once · all the words which use that spelling pattern. As we move on, we learn some more elaborate patterns such as the a-e, where the two letters a and e are separated by a letter, as in bake, cake, date, fame, game, hate, lake, make, name, rake, same, tame, wake, etc. Once again we learn many new words all at once. Similarly for i-e as in time, o-e as in poke, and u-e as in flute. And once again, as we introduce each new spelling pattern, we present a new story that includes many words with that new pattern · as well as any of the words we have learned before. Progress is very fast using this technique. There are some spelling codes that use 3 or 4 letters. Take for example, all as in ball, fall, tall, hall, etc. Later in the program, we present patterns such as tion as in action, nation, fraction, etc. Of course there are some words which do not obey these rules. There are 50 very common small English words which must be learned by sight. Words such as a, of, the, to, you, etc. We introduce 1 or 2 of these "sight" words with each early story, clearly warning the student that these are special words that do not follow the rules. We call these special words so that students will not confuse themselves by trying to sound them out. If you do not count these 50 most common sight words, over 95% of written English does conform to the code rules that we teach. There are some words that have odd spellings such as eye and yacht. We present a few of these special words with each of the later stories for older children. This way, only a few words of English must be learned by heart for each story. 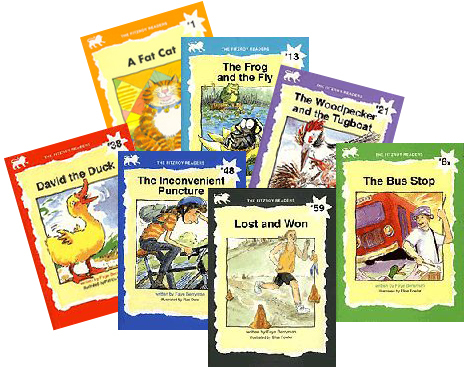 Many thousands of children have experienced breakthroughs in learning English from the Fitzroy Readers. There is no simple answer to the question of age levels for each Fitzroy Reader. There is great variation amongst children in reading readiness and stage of progress. The best approach is to look through the readers with the individual child. If you are satisfied that they can safely read the last book from a given pack of readers, then you would start with the next higher pack. Some children respond to the phonic build-up of vocabulary very quickly, and may race through the readers more quickly than shown on the table. If they are learning to write as they go, the process takes longer. This involves being able to write sentences that are read out to them from a reader. Some children are later readers and may be working on Readers 51-60 in early secondary school. *Legend: RRL: Reading Recovery Level, Sequence: Sequence Within Level, Reader: Fitzroy Reader Number, Title: Title of Story, Pack: Pack. Ultimately the strength of any educational institution, be it a kindergarten, primary school or university, rests on the quality of its teaching personnel. Fundamental to this teacher quality is teacher training. Get the training right and you're over halfway to success. Participants can complete a short assessment. A successful pass awards you with a Fitzroy Teachers' Certification, this certifies you are competent to teach the Fitzroy Method.